"Amazing how far a little tender lovin' care can go." 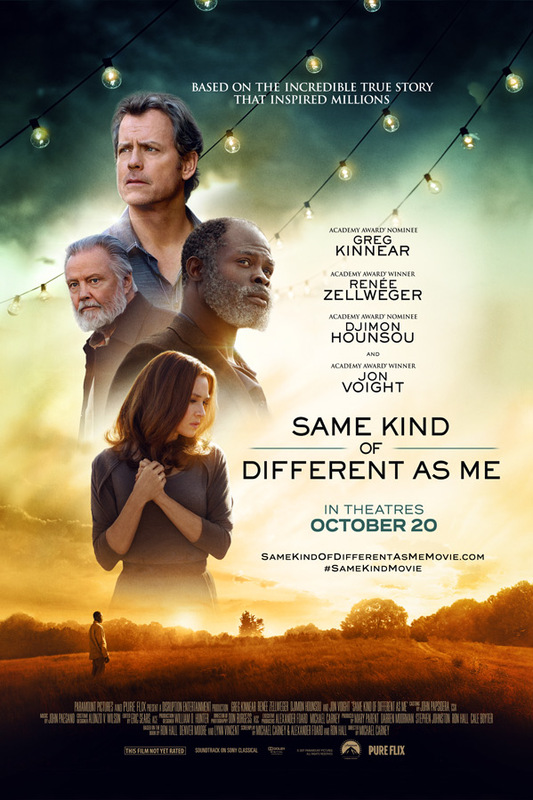 Paramount and PureFlix have debuted another new official trailer for the heartfelt drama Same Kind of Different as Me, from director Michael Carney. This was originally scheduled to open in February, but was delayed seven months and is now being released in October, if anyone still wants to see it. Greg Kinnear stars as a family man who befriends a homeless man, played by Djimon Hounsou, and changes his life through a bit of kindness and friendship. The film also stars Renée Zellweger in one of her other major roles (aside from Bridget Jones's Baby) after her hiatus, along with Jon Voight, Olivia Holt, Ty Parker and others. This doesn't look any better than it did when we posted the first trailer last year, but perhaps these a few good performances in this worth appreciating. You can also watch the original trailer for Same Kind of Different as Me from last year here, to see more. A modern-day slave, an international art dealer, and the unlikely woman who bound them together. The film tells the story of an international art dealer Ron Hall (Greg Kinnear) who must befriend a dangerous homeless man (Djimon Hounsou) in order to save his struggling marriage to his wife (Renée Zellweger), a woman whose dreams will lead all three of them on the most remarkable journey of their lives. Jon Voight plays Hall’s father, with whom he reconciles thanks to the revelations of his new life. Same Kind of Different as Me is directed by Michael Carney, making his feature directorial debut with this after a short film previously. The script is adapted by Ron Hall, Alexander Foard, and Michael Carney. Paramount will finally release Same Kind of Different as Me in theaters starting October 20th in the fall. Still interested?